The search for spring clothes at 32 weeks pregnant (only 8 more weeks until I’m due!) can be a struggle to say the least. That’s where HATCH comes in handy. 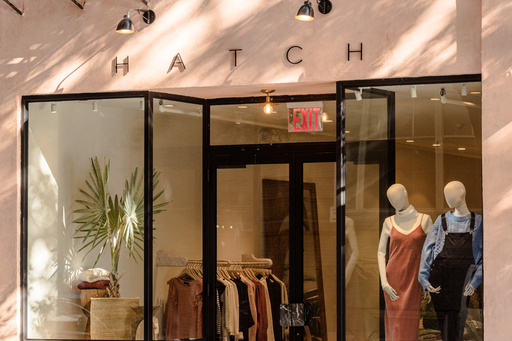 HATCH was founded by Ariane Goldman in 2011 and has store-front locations in New York and Los Angeles for mamas across the coasts. The best part about this brand is the fact that the clothing can be work during and even after pregnancy. Take a look at these 5 finds from HATCH’s Pre-Spring 2019 maternity line. Minimalistic mamas will enjoy this flowy, earth toned dress with its open neckline, empire waist, and fitted sleeves. Chunky jewelry in jewel tones or layered necklaces are the ideal accessory for this sleek, semi-bohemian number. The material is stretchy and won’t constrict a baby bump. Boyfriend styled shirts like this navy blouse are essential for those who like a more loose fit without having to sacrifice style. The gingham print is visible without being too jarring, a common issue with patterned fabric. This particular shirt would look great dressed down with jeans or dressed up with a pair of slacks. Typical office trousers are in neutral hues such as gray, black, or white. However, the Beckett Trousers by HATCH bring a pop of color in this warm, sandy shade. These trousers are roomy at the navel, but streamlined down the legs for a sophisticated fit. Florals are embedded in spring fashion as evidenced by this stunning jumpsuit. This particular jumper is appropriate for any occasion. Plus, it’s easy to wear due to the adjustable straps and the zipper conveniently located on the back. Just because you’re expecting, doesn’t mean you have to say goodbye to bodycon. The cotton rib knit fabric of the Celine Dress hugs every curve of the body as it grows, but doesn’t get stiff or lose shape.